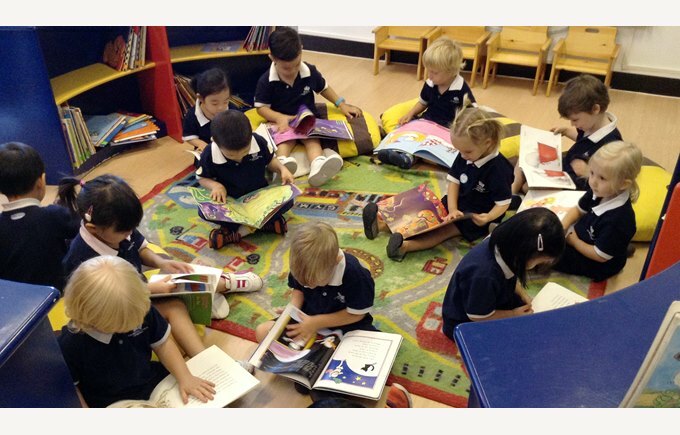 Following on from Pre-Nursery, in Nursery we teach our children about the importance of reading and the need to take care of our books. From a young age, children need to understand that books can be used, both for pleasure, as well as, to find out information. An important area of every classroom is to have a comfy reading area where the children have the opportunity to sit down and read a wide selection of books. Part of our school life involves taking books home. To support children's understanding of this we have weekly visits to our school library to share the children's love of stories and rhymes, as well as, to enjoy taking the responsibility of taking the book home to show our family. This is a great opportunity for the children in Nursery to handle the book carefully, turning the pages, and to understand the concept of exchanging our reading book for a new one the following week.